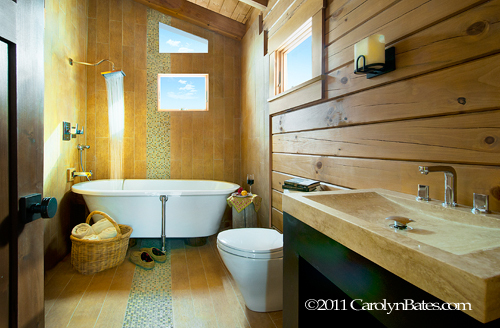 Vermont Photographer Carolyn L. Bates - Photographer's Blog - Carolyn Bates' Blog - Aspen Construction Services, Corp.
We take the time to understand our clients, spend many hours with them to bring to the forefront what they really want to achieve in their project, and to understand their financial and risk tolerance. By risk tolerance we mean, for example, we are always looking for better methods and products to achieve the project goals, and this sometimes means we reach out beyond accepted practices. In a recent project in the Catskills we incorporated new geo-thermal technology - the first installation of a combination module from Eco-Logix out of Canada that will, combined with a first rate design and installation, deliver a COP of at least 4 and may even approach 5 (the Coefficient Of Performance of a heat pump is the ratio of the change in heat at the "output" to the supplied work - a higher COP is better, and you gain high efficiency at a level of 3). The clients were willing to go this route because they wanted the best. We take the time to understand this about our clients, and to deliver an approach that best serves them. We develop the right project environment - a collaborative environment where we encourage and require value-engineering from our contractors, and work with them to increase our knowledge base - thereby not just meet, but go beyond project specifications. We rely on the expertise that each team member brings to the table by focusing on his or her niche. We gain buy-in from each team member - first by creating good and thorough contracts, and second by delivering the support they need in the field, and finally by being good cheerleaders and helping our team members be the best they can be. When the inevitable happens, and we push the contractor to do better, we do so in a way that avoids discouragement and leads them to want to deliver more. We have a large network of professionals with whom we work, and when we go into a new geographic area, we do alot of research to find and vet new contractors. Many of our people will travel long distances because they enjoy working with us and know that we are fair and have fun. We are hands-on at every step of our projects - we are on site each week, and when we are not, we have a member of our team on site. We know that when the cats are away, the mice will play, so we avoid down-time and re-do's by staying on site to motivate and to ensure installations are not short-cut. We are extremely cost-conscious. Most of our work is done on a cost-plus basis. We have found that this is the most cost-effective delivery system for our clients. Our experience at contract negotiation means that we get the best contractors at the best price, and we pass on those savings to the client directly. We have a track record of saving tens to hundreds of thousands of dollars for our clients, depending on the project budget, and that savings always more than covers our fees - so the clients save on inflated estimates, and added contingency and errors and omissions line items that are included in standard fixed price contract delivery approaches. We hope this helps give you a bit of an understanding of our difference. We believe building should be fun, and the only way to achieve that is to make it fun - start with good planning, good specifications, and good contracts, build the right team and project environment, and actively participate in the project to deliver on our clientsʼ requirements. Most importantly, we know that we can't know everything - when we believe we do, we will surely falter. We never stop learning from everyone we meet, because we know that's what it takes to be the best. You can learn more by visiting our website www.aspenvermont.com. You can view a series of videos on the Catskills project that you might find interesting. 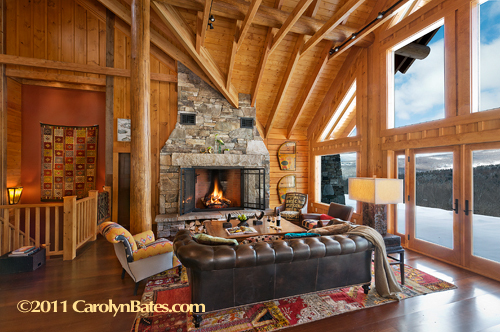 This home was featured in the February 2011 edition of Builder-Architect Magazine, including noted photographer Carolyn Batesʼ fabulous shots of the finished product. There is also an article in that issue on our project from Tennessee Log Homes (the log home supplier), and from Lloyd Hamilton (our building science and energy consultant) describing the geo-thermal system. Enjoy!